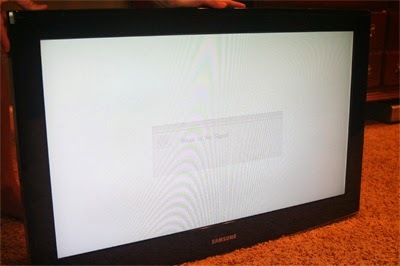 Samsung has a design flaw in their LCD TV's . The flaw leads to something called a "whiteout" wherein the screen turns bright white and nothing is displayed. The problem is a PCB situated on the top back of the panel . This PCB is covered by a metal cover with which it eventually shorts. Insulating The metal studs under the metal cover solves this issue! . Use insulating tape (electrical tape ) . Also Insulate under the PCB . Just in case .. Don't stick tape to PCB! .. just under PCB and over the metal studs touching the PCB . JKturner has an excellent article on the same so I wont repeat the whole thing here . His however is for the 32 '' TV. It's a good read for anyone attempting to solve the 21 inch but remember , on the 21, there is only one PCB at the top back of the panel (after you have removed the chassis housing the motherboard and SMPS). An open TV chassis can be somewhat intimidating to some, so be brave but be gentle with the internal connectors. BTW, this became my first TV hack partly because I was too lazy to take it to the service center :P and partly because It appears that the service center folks misdiagnose it ( perhaps deliberately !) as a blown panel and charge the consumer for a new one .... and the whole hack worked like a charm !! .